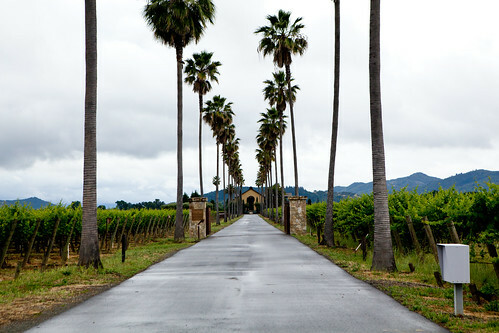 During my family vacation to San Francisco, we drove to Napa and Sonoma Valley as a day trip. One of our stops was Round Pond Estate, particularly their olive oil mill at the town Rutherford. 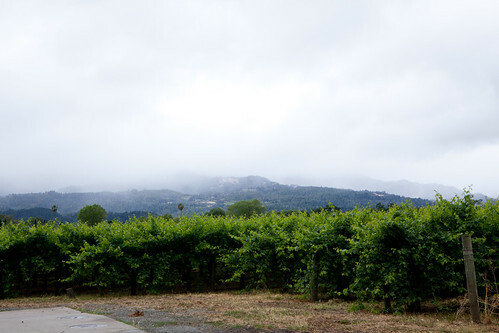 During that time, it was a dreary, rainy morning on the way up North to Napa Valley. The good news was that it stopped raining by the time we arrived to Round Pond, even though it’s still cloudy. 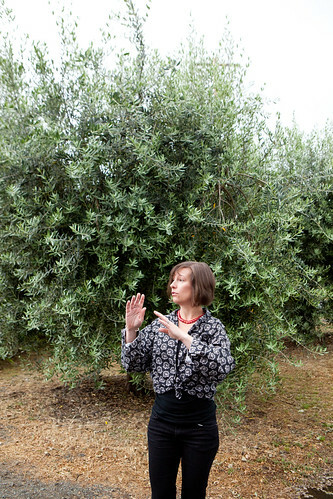 I chose to have an olive estate tour since I never seen olive trees in real life and I could taste their own olive oils on the grounds they’re made from, which is unique in itself. 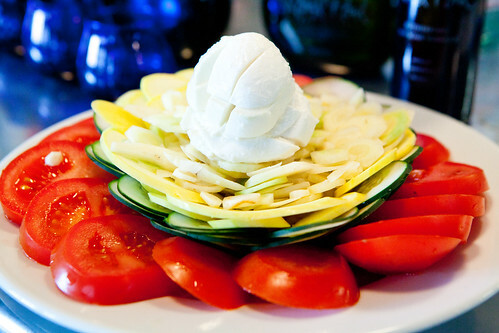 This satisfies both my mind and stomach. 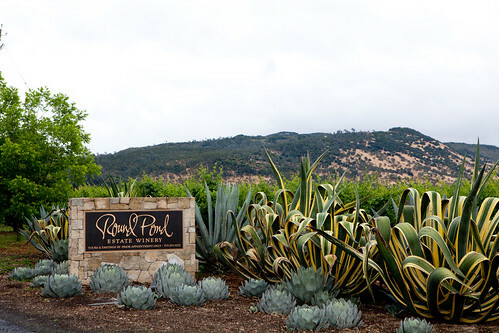 Round Pond have large estates that grows both grapes at their winery (primarily Cabernet Sauvignon) and they undertook the planting of several varieties of imported Italian and Spanish olive trees for the production of premium oils in 1998 that spans to 12 acres. 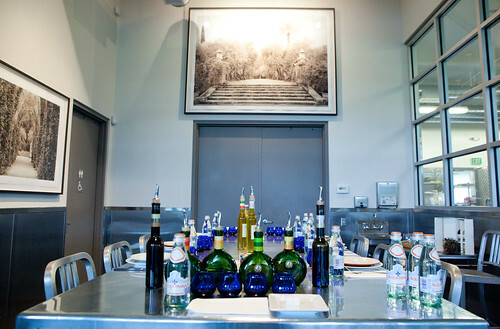 The estate is passionate about offering the best products and constructed a state-of-the art-mill to ensure absolute quality in the production of their artisan oils. What I’ve learned is that Round Pond is one of the few privately owned and run olive mills. 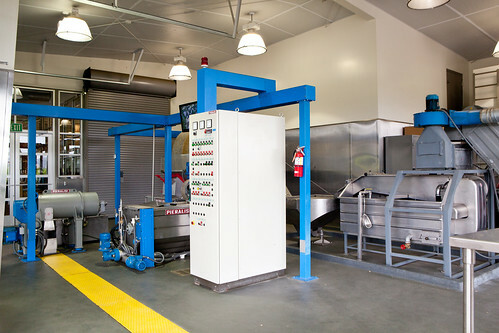 A majority of California-made olive oils grow their own olives but processes it at public mills, where they time share with others to mill their olives to press out their oils. 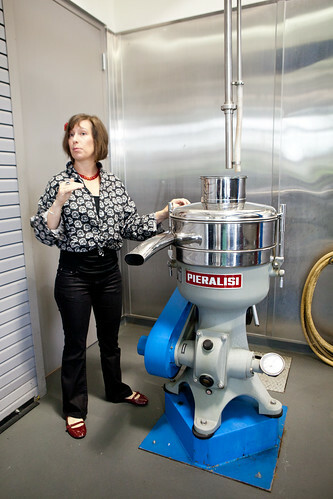 Their mill uses Pieralisi machines exclusively to process their olives. 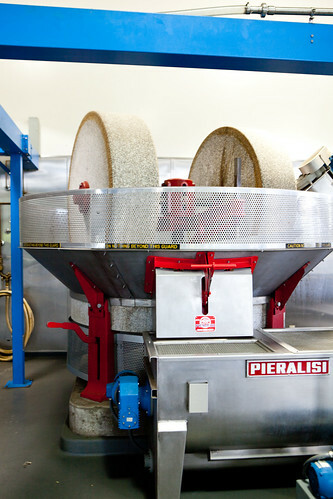 Round Pond does process their oils two ways – one is by grinding it with millstones (as photographed above) and the other is by a hammer crushing machine that pounds out the olives to press out the olives. You can expect to get from 10-40 gallons per ton of olives. Bringing that down to a smaller ratio, you can possibly get 0.5 to 2 gallons of oil from 100 pounds of olives, depending upon the type of olives and how the fruit that year. When we walked back to the tasting room where all the bottles of their olive oils, vinegars, and their recent launch of flavored syrups. 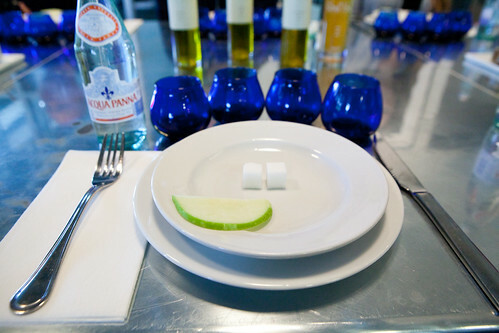 We started off by learning how to taste olive oil with the blue glasses. The purpose behind the color and shape of that glass was to deter the taster from caring about the color or appearance of the oil (e.g. a deeper gold-green color does not mean better tasting oil) and the shape of the cup lets you smell the aromas of the oil, as it’s heated by the palm of your hand. We sniff, take a sip but inhale through the mouth so it’ll disperse the fine spray within your mouth (sort like what a wine taster does) and think how it tastes and your body would react to the oil. I find their Italian Blend had a lovely grassy scent and flavor with a spicy, peppery finish. The Spanish blend is softer, silkier and smoother. 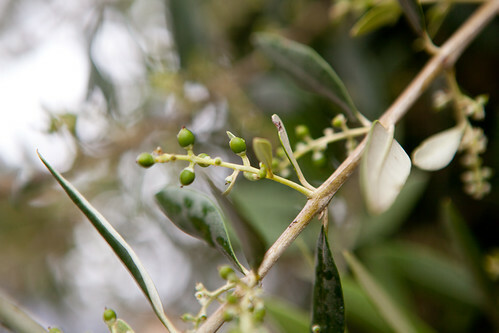 The main difference between the two oils, besides that they’re picked from different types of trees, is that the olives for the Spanish blend is picked at a later time. Therefore, it is a more ripened olive. We also tasted their red wine vinegars – namely the Merlot Cabernet (sweet, cherry flavors) and Cabernet Sauvignon (slightly peppery finish) – and their flavored fruit syrups: Meyer lemon and blood orange, without any food. 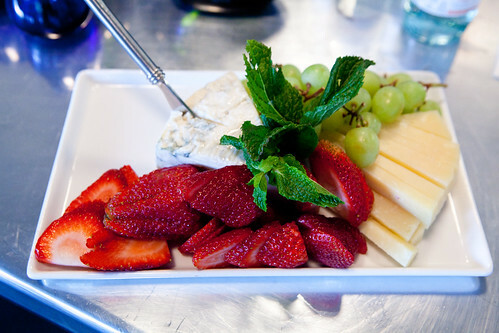 Eventually, we had a meal with these delicious oils, vinegars and syrups with their garden grown vegetables of tomato, summer squash, and strawberries, and cheeses from a local cheesemaker Cow Girl Creamery. The best pairing that is still in my mind is the Meyer lemon syrup with pecorino cheese. But everything was simply wonderful. 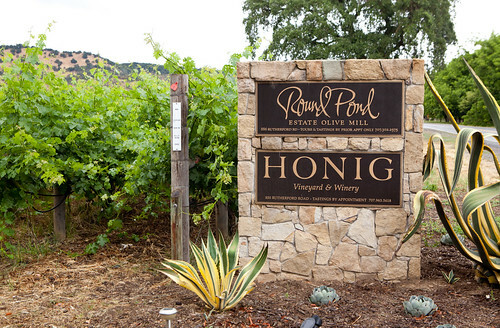 If you have the opportunity to be in Napa, you should make an appointment to see and taste Round Pond Mill. It’s lovely and the oils are very tasty. 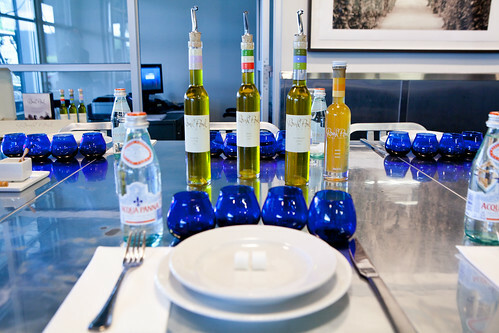 Olive oil tour by appointment only.